﻿Welcome to Part Two of my Oscar predictions - the big one that Annual Awards Nerdism for 2011 has come down to. My Steve - The longshot. 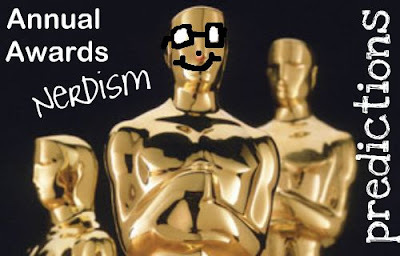 ﻿This category is better explained in the piece I did for this years 'LAMB Devours the Oscars'. But basically, we all know who's going to win, don't we? Being as sheltered as we are here in New Zealand, there is only one film of this lot that has come out here, but of course, I'm too young to see it. And, unfortunately, because no one in Dannevirke likes reading a movie, I'll probably never get to see any of these unless I fork out and buy 'em all. So I'm just all about the statistics with these ones. In a Better World, Haeven, Civilization...whatever you call it, has a good chance of winning if it capitalizes on its Golden Globes win. Biutiful has a good chance of winning because it stars Javier Bardem in his Oscar nominated performance and you can't go wrong with Alejandro González Iñárritu. Dogtooth might win because it has been widely viewed...and it looks pretty disturbing. Incendies might win because it has some very high ratings in high places. Outside the Law might win because it tackles an Oscar favourite topic: WW2. My money is going with Civilization. Also, being as sheltered as I am in Dannevirke, Documentaries don't get very far here, either. I plan to watch Exit Through the Gift Shop some time soon...it has been out on DVD here for two months but we never got it at Blockbuster so I shall wait for it to get really cheap or get it off iTunes or something. So of course, I haven't seen any of these either (slack, I know), and it looks like I'll be going with the statistics. They all tackle very serious topics. I've heard great things about all of them. But I'm hoping that Exit Through the Gift Shop will win, because of all the Banksy hoopla. Wouldn't that be interesting? I think Inside Job will probably win though, seeing as it has gained so much momentum of the past few months. Though, essentially, some of my favourite cinematography happens in Black Swan, and whatever Matthew Libatique does is amazing, I simply can't ignore Wally Pfister﻿'s achievements in Inception. This definitely has to be the year for him. His main competiton comes in the form of the beautiful, show stopping cinematography in True Grit, which has a major chance of winning, also. You can't dismiss the work done in The King's Speech and The Social Network though. There is just too much goodness in this category! Without Inception here, this category feels like a bit of a blur. Oh well, here's an award which The Social Network can take the lead in, and The King's Speech has no chance with. The editing in Black Swan is a favourite of mine too, because Darren Aronofsky's films need perfect editing otherwise they all just fall flat. 127 Hours has brilliant editing too, with all the split screens and what not. The Fighter is a likely chance too, but its down to The Social Network with slight competition from Black Swan, I think. This is a strange wee lineup here, but we all know who will win: none other than glorious Inception. The other nominees? Meh. Alice in Wonderland is too bright and Tim Burton-y for my liking. HP7PT1 is Harry Potter, so it has a nice chance. Hereafter didn't even get a cinema release here, which is weird considering its a Clint Eastwood flick. Weird thing is, you wouldn't expect a Clint movie to be in this category, would you? Iron Man 2...now that is a strange nomination. Come to think of it, the visual effects aren't too shabby. If Inception doesn't win, though, there will be a riot on my behalf. See you back here tomorrow, same place, around the same time because it will be Friday (!). I will take a look at the writing awards and the directors. I would like True Grit or TSN for cinematography. I will second you on the riot, though it should never take place. I don't want to sound fkattering but damn I can't wait for tomorrow to read the third part. Nikhat - I agree with you. And the riot should hopefully never take place, yes. Lesya - Thanks! I shall start on it soon.